Flowering went through last month. Was it all easy-peasy? In essence yes, but there are some differences between regions and vineyards. May proved very warm and extremely dry, which led to some water stress but also allowed nature to accelerate its development. As a result, after budbreak only a few days ahead of average, flowering happened up to a solid 1-2 weeks ahead of long term averages. Vines in less ideally exposed sites in the Middle Mosel only flowered later, as noted for instance by Constantin Richter at Weingut Max Ferd. 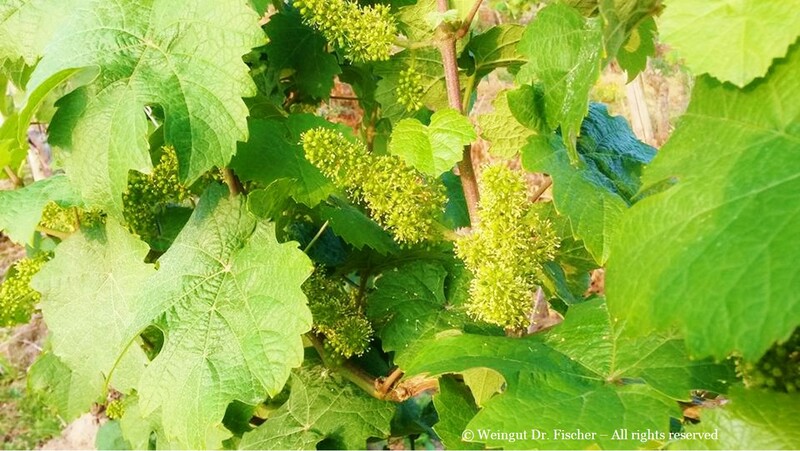 Richter: "Flowering in our top vineyards was done by mid-June, as you can see here below in the Brauneberger Juffer-Sonnenuhr. However our vineyards for our Estate wines in Burgen, Mülheim and Veldenz were much later in the month”. This was echoed by Karl Erbes, the “senior boss” at Weingut Karl Erbes, who has over 50 vintages of experience in his arms (and legs!). He noticed strong differences between better and lesser parcels in the Middle Mosel: “The flowering went through quite easily in the south-exposed sites. This happened in our top parcels by June 15-20 under glorious weather. However, the weather changed after that and became definitively cooler. This effectively delayed flowering in the lesser parcels to much later in the month [NB: one needs 20°C / 68°F for flowering to take place]. In principle, these differences in ripening will only magnify as the season progresses. We could end up with strong differences in ripeness between top and lesser vineyards, as in 1971 and 1969 for instance." Christian Vogt from Weingut Karthäuserhof in the Ruwer Valley goes along the same lines. He even saw some coulure, i.e. flowering not going through, but is actually not unhappy about it: “Flowering was quick at first but then took quite some time to complete given the cooler weather conditions. We have some coulure but I am actually quite happy about it because I want airy grapes”. So all in all things do look fine in 2015 so far. The only “real” issue has been the severe drought which affects the region. Thankfully, the situation relaxed somewhat after some days of rain at the end of June, but overall, there is still a water deficit in this vintage. And the heat wave which has swept through Europe since beginning of July does certainly not help.